You are here: Home / Passages / Acts / Acts 16 Why did Paul baptize a household? Acts 16 Why did Paul baptize a household? In Acts 16, when Luke reports on the conversion of two locals (a wealthy merchant named Lydia and a jailer), he tells us that Paul baptized their entire households. Why would Paul baptize an entire household? Paul made 3 major missionary journeys. He first visited the Macedonian town of Philippi on his second journey which is recorded in Acts 16. Typically, when Paul entered a new city, he went to the synagogue on the Sabbath and proclaimed the gospel. Since he do not go to a synagogue, we can presume there was none. Instead Paul went to a place by the river where some women gathered to pray. Paul has been arrested, beaten and thrown in prison. During the night, an earthquake opens the doors of the jail. When the jailer realized, the prisoners all remained inside, he rushed into their cell. Many denominations practice baptizing their infants as a sign of the covenant and Acts 16 is one of the places they use to support the practice. I’m not going to discuss the issue of infant baptism. If you’re interested in that, please read the debate on infant baptism between John MacArthur and RC Sproul. Instead I want to look at this issue of baptizing a household from a Bible study standpoint only. What clues do we have in the text that might help us figure out what is going on – regardless of its theological applications? Chapter 16 is the first time in Acts that baptizing the whole household is mentioned. That suggests it may not have been a common practice. If Paul told Lydia and the jailer to baptize their households, that would add a lot of weight to the infant baptism camp because we have an apostle saying this is the kind of practice you should practice. However, there is no evidence that Paul made such a request and I would argue given his other writings — particularly his discussion on how and why he circumcised Timothy — I would argue it is unlikely that Paul made such a request. The second possibility is that Lydia and the jailer as heads of the household gave the command that everyone in their household be baptized. That kind of request fits with what we know of the culture at the time. The head of the household dictated what religion would be practiced in the household. However, given his other teachings, I don’t think Paul would baptize someone who is essentially being forced into the ritual. The third possibility is that the entire household heard Paul’s teachings, came to faith and the individuals themselves asked to be baptized. As unusual as that possibility seems to us, it strikes me as the most likely possibility. We have evidence for that position: Acts 16:34 could be translated as the NASB does translate it ” …having believed in God with his whole household” suggesting that everyone in the jailer’s household came to faith. We don’t know how big those households were (They could have been comprised of 2 people or 20 people). Further, we don’t know how open or closed they were to the gospel prior to Paul’s visit. Especially in Lydia’s case, as a god-fearer, you could expect that those of her household would be similarly open to God. 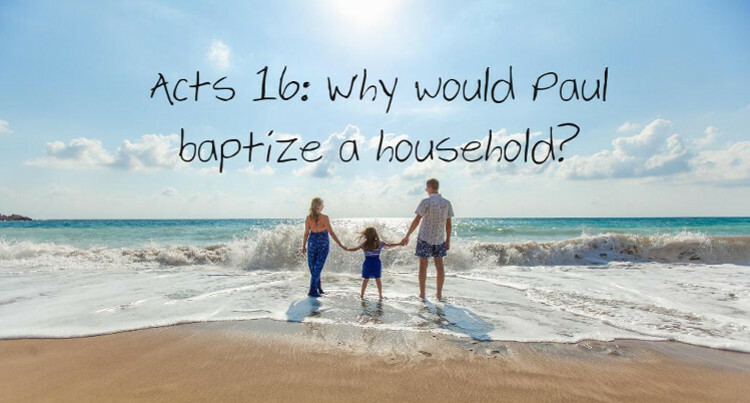 Whatever you think Acts 16 says or doesn’t say about infant baptism, it seems to me that the most likely possibility is that the entire households were baptized because the entire households came to faith. How many letters did Paul write to the Corinthians?